Anthony William, who bills himself as the "Medical Medium," has two bestsellers so far, has been a guest on several television shows, does regular radio programs, and has a large following on social media. A vital fact is that William uses the word "medium" of himself, which seems to go unnoticed by many. Yet that is the most crucial point about him. 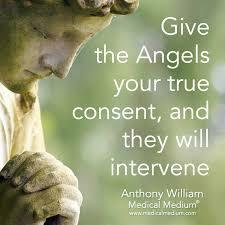 Quote==You were born with the divine right to reach out to the angels whenever you need them. They hear you, they see you, and for your entire life, they've witnessed your joys and hardships. They want you to contact them. They want to help you more. The secret is, you have to know which angels to access, and you have to know how to access them. Anthony William then goes on to discuss the Angels of "Harmony, Solidarity, Insight, and Enrichment." There is a podcast called "Secrets About Angels," which Anthony William did with New Age publisher Hay House, in which he continually refers to "Spirit" whom he says he is consulting. He asserts that we have a "God-given birthright to have help from and access to the angels." He also speaks of female angels; however, all angels in the Bible are referred to with male pronouns. Nor do any angels named in the Scriptures have names like these. In fact, we only know the names of two angels: Michael and Gabriel. Satan is not a proper name but is a title meaning "the Adversary." This man from whom so many take health advice considers himself an expert on angels and this is where he claims to get his information. William has no health background or training and he is contacting spirits, contrary to God's word forbidding it. After a good 20 years in the New Age and being a professional astrologer, as well as having taken numerous New Age classes, having participated in seances, and having been surrounded by psychics, mediums, witches, Wiccans, Neopagans, astrologers, palm readers, Tarot card readers, I Ching readers, and others, not to mention all the New Agers I knew, I know very well what "Spirit" means. When anyone claims to hear from "Spirit" or get messages from "Spirit," this means the person is a psychic, medium, and/or New Ager. This includes Anthony William, the "Medical Medium." The word "medium" probably refers to the fact he is a medium (a contact for a supernatural source not from God) for Spirit and the angels. What if His Advice Helps? "...women in my neighborhood group are raving about how it's (William's book) helping. One said, I don't know if he's a medium or not but his methods are helping me." Sadly, pragmatism is alive and well. Pragmatism is "an approach that assesses the truth or meaning of theories or beliefs in terms of the success of their practical application." The placebo effect, coincidence, use of conventional treatments, and the self-limiting nature of most illnesses are ignored as possible factors in this advice having "worked" for them. "Sadly I been on his protocols as a result of desperation and it almost destroyed my health! I just want to warn everyone out there. It all starts really nice and it's working and then it's just slowly 'killing you.'" "This is how it always starts. If it was ugly from the beginning - no one would follow those teachings. There is always a trap in the beginning...a brilliant disguise." William has bestsellers and appears on TV only because he was initially promoted by New Age celebrity Gwyneth Paltrow on her famed GOOP blog. Just as Oprah has given many writers bestsellers by having them on her program, so Paltrow has given celebrity status to Anthony William. Direct spirit contact is one of the most dangerous forms of occultism. But it is not just Anthony William who does it; he wants his followers and readers to do it as well. Contacting angels, who are spirits, is forbidden by God. There is not a single instance in the Bible of anyone knowingly contacting or calling on an angel. God sends his angels at his will, and only fallen angels respond to contact from humans. None of the angels named by William exist in the guise or roles he gives them. William is like any other medium or psychic. I taught astrology at an organization that had psychics and mediums as teachers and who also ran the organization. They were my fellow teachers; some were friends. I hung out with them. So I know what talking to "Spirit" means. William refers to God now and then, but this is not the true God. It is the god believed in by psychics and mediums. William's consultation with Spirit is not with the Holy Spirit. Nor does the Holy Spirit give health advice. William is in rebellion against the true God or he would not be doing what he is doing. "If a prophet or a dreamer of dreams arises among you and gives you a sign or a wonder, and the sign or the wonder comes true, concerning which he spoke to you, saying, 'Let us go after other gods (whom you have not known) and let us serve them,' you shall not listen to the words of that prophet or that dreamer of dreams; for the LORD your God is testing you to find out if you love the LORD your God with all your heart and with all your soul." In this passage, God says that even if a prophet or dreamer of dreams has prophecies and dreams that come true, but he leads you to serve other gods, then "do not listen" to that prophet or dreamer of dreams. The test is NOT whether the prophet or dreamer is right, but which god does he serve. Applying that to Anthony William, it is quite clear that even if his advice seems helpful or works, we are not to listen to him because he serves another god. It is plain that he serves "Spirit" and the (fallen) angels whom he contacts for information, and whom he promotes to others for contact. Anthony William is a medium for this Spirit and the angels. Anthony William has zero credentials in nutrition, diet, medicine, or anything that would qualify him to give health advice. He even has a disclaimer on his website to that effect. Yet he dispenses advice like he's giving out candy. Please do searches for articles warning about the pseudoscientific advice William gives. I don't think many realize that occultists like Anthony William can talk as though they are Christians or as though they believe in Jesus and the biblical God. They can use the same language, like saying "God" or "the Most High." Consulting William or taking his advice is no different from taking advice from any medium and his/her spirit guides. "If a person turns to mediums and necromancers, whoring after them, I will set my face against that person and will cut him off from among his people,"
"So Saul died for his breach of faith. He broke faith with the Lord in that he did not keep the command of the Lord, and also consulted a medium, seeking guidance. He did not seek guidance from the Lord. Therefore the Lord put him to death and turned the kingdom over to David the son of Jesse." "When you come into the land that the Lord your God is giving you, you shall not learn to follow the abominable practices of those nations. There shall not be found among you anyone who burns his son or his daughter as an offering, anyone who practices divination or tells fortunes or interprets omens, or a sorcerer or a charmer or a medium or a necromancer or one who inquires of the dead, for whoever does these things is an abomination to the Lord. And because of these abominations the Lord your God is driving them out before you. You shall be blameless before the Lord your God." Please consider who William is getting this information from. Just who is the "Spirit of the Most High?" Do you think the "Most High" is really God and that God would give a gift for something he denounces? Have you wondered what kind of God this is, or who the real God is? God is the Creator of the universe. He knows all, cannot be confined, and is love, mercy, patience, wisdom, justice, peace, and goodness. He will judge one day because he cannot tolerate sin, which is why we know there is justice. None of us can reach God's standards but he sent his Son, Jesus Christ, to pay the penalty for sins so that all who believe in Jesus can have eternal life. Jesus did this willingly and invites all to the dwelling places he prepares for those who believe (see John 14:2).